In a show of city support, Nottingham Playhouse and the National Justice Museum (formerly the Galleries of Justice Museum) will be hosting the Theatre Royal Nottingham’s annual Colin McIntyre Classic Thriller Season in July 2017. Phase II of the Theatre Royal and Royal Concert Hall’s royal transformation project will mean the closure of both venues for most of July, August and September as building work takes place on the venue’s new entrance on South Sherwood Street. The Colin McIntyre Classic Thriller Season, a month-long repertory season which has returned to the Theatre Royal every summer since 1988, would have fallen within this closure period so two alternative venues were found to house the popular annual murder mystery season. 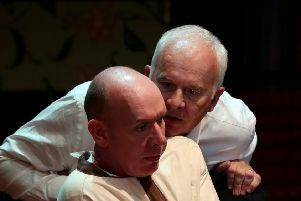 Nottingham Playhouse will host two plays; Dial M for Murder by Frederick Knott from July 11-15, and Dangerous Corner by J.B. Priestley from July 18-22. The National Justice Museum will host a new comedy drama, Marie Lloyd and the Music Hall Murder by Karen Henson, performed in the museum’s courtroom from July 25-29.
ickets are priced from £16 - £24. See all three plays for £54 (evenings) or £45 (matinees). Book through Theatre Royal & Royal Concert Hall box office www.trch.co.uk or Nottingham Playhouse box office www.nottinghamplayhouse.co.uk.